The goal of planning for wildlife at both the landscape and community scale is to support Arizona’s growth, and economic development while ensuring sustainability, diversity, and safe movement of Arizona’s wildlife populations. The Arizona Game and Fish Department has assembled wildlife conservation data, maps and tools on this page, to help inform and guide project planners in a manner that maintains the quality of Arizona’s landscapes and minimizes negative impacts to wildlife and wildlife habitat. Responsible and informed growth today helps ensure Arizona communities continue to enjoy and economically benefit from wildlife-related recreation. The Project Evaluation Program (PEP) provides policy, technical assistance, and environmental law compliance guidance and oversight, and coordinates the Arizona Game and Fish Department’s review of internal and external policies, plans, and projects affecting fish and wildlife resources in Arizona. Submit project evaluation requests to pep@azgfd.gov. Use the Project Evaluation Request form to help identify information PEP needs to evaluate your project. Arizona’s Online Environmental Review Tool. This tool provides a special status species list for Phase I Environmental Compliance and NEPA documents, and provides information and guideline links for incorporating wildlife conservation into project planning. This information can be used to guide preliminary decisions and assessments of proposed land and water development, management, and conservation projects. Habimap Arizona. The Arizona Game and Fish Department developed HabiMap™ Arizona – a user-friendly, web-based data viewer – to make information contained within the State Wildlife Action Plan available to the public, planners, and our partners. Use HabiMap™ to help inform landscape-scale planning, to provide initial risk assessment for early project planning, and to gain a general understanding of Arizona’s wildlife conservation potential. 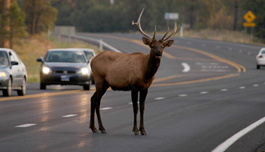 For information on wildlife conservation potential at a west-wide scale, please go to the Western Association of Fish and Wildlife Agencies’ Crucial Habitat Assessment Tool (CHAT) at www.wafwachat.org. 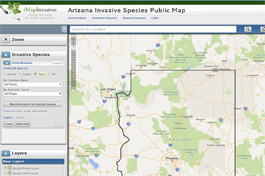 iMapInvasives Arizona is an online data management tool that is a standardized, central repository of location information for all invasive species taxon. The tool facilitates data sharing and utilization by land managers, the public and other organizations. The database stores basic point locations of invasive species observations, but also allows for advanced data management, including the capability to input treatment records, survey records, and track infestations over time. Use this tool by contributing data, planning and collaborating projects, or monitoring infestations. Wildlife-friendly guidelines. The Arizona Game and Fish Department has developed guideline documents and Best Management Practices (BMP), that include recommendations for incorporating wildlife conservation into project planning. Guidelines created to date can be found here. Wildlife and habitat connectivity. As Arizona’s human population expands into previously undeveloped areas, the wildlife that call those places home have to travel through new communities and developments and cross roads and canals to reach the resources they need to survive. Information on concepts behind wildlife connectivity and the efforts currently underway in Arizona to keep our landscapes connected are available here. State wildlife action plan for Arizona. This State Wildlife Action Plan (SWAP) is a nationwide mandate by Congress to be proactive and help conserve wildlife and natural areas before they become rare and more costly to protect. The SWAP is intended to support conservation efforts that preclude the need to list species under the Endangered Species Act (ESA) by “keeping common species common” and addresses a wide variety of constituency concerns for wildlife and habitat conservation. Central Arizona grasslands conservation strategy. The Central Arizona Grasslands Conservation Strategy (CAGCS) was originally created in 2010 and was revised in 2014 by an interagency team of cooperators, including the Bureau of Land Management (BLM), Prescott National Forest, Tonto National Forest, Natural Resources Conservation Service (NRCS), and Arizona Game and Fish Department. This is an integrated management strategy for conservation and restoration of grassland ecosystems and associated pronghorn populations in central Arizona. Arizona’s Natural Heritage Program – Heritage Data Management System (HDMS). The HDMS is part of a global network of more than 80 natural heritage programs and conservation data centers. It provides species, abstracts, species lists by county and more.